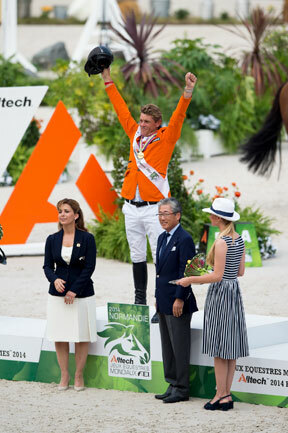 Jeroen Dubbeldam made it double-gold at the 2014 Alltech FEI World Equestrian Games™ in Normandy today when adding the individual title to last Thursday’s team victory for The Netherlands. He made his way into this afternoon’s top-four Jumping final thanks to a horse that he admitted was inexperienced at this level of the sport and which clearly surprised him during the week. But the 10-year-old Dutch-bred Zenith lived up to his name when providing his 41-year-old rider with a title he has wanted for a very long time. For Sweden’s Rolf-Goran Bengtsson it was a disappointing day as he missed out on the podium. Faulting with his own horse, Casall ASK, in the first rotation of horses he did it again with both Delaveau’s Orient Express and Dubbeldam’s Zenith. However Madden’s bronze, following silver at Aachen (GER) in 2006, was hard-won when the 50-year-old New Yorker finished just two faults ahead of the Swede after also having a fence down with each of her opponent’s rides. Delaveau was understandably disappointed that he couldn’t deliver the gold on home ground, and the 49-year-old rider who won European bronze at Aachen in 1986 and team silver at the Alltech FEI World Equestrian Games™ 2010 in Kentucky said: “that will stay in my head for a very long time. I wasted a bit of time on the approach to the second-last fence and then I added a stride to the last and took too long to get to the finish. I realised what I had done when it was too late,” he admitted. The man whose sparkling career really took off when he won individual gold at the FEI European Young Riders Championship at Millstreet in Ireland in 1994 with a horse called Killarney, has since added individual Olympic gold at the 2000 Olympic Games at Sydney, Australia and team gold at the FEI World Equestrian Games™ in Aachen, Germany eight years ago. It has taken him some time to find a horse of the calibre of Zenith to take the place that he held in his heart for his Olympic ride De Sjiem. Top-Four Jumping Final: GOLD – Jeroen Dubbeldam (Zenith SFN) NED, 0 faults; SILVER – Patrice Delaveau (Orient Express HDC) FRA, 1; BRONZE – Beezie Madden (Cortes C) USA, 12; 4, Rolf-Goran Bengtsson (Casall ASK) SWE. 14.